You still have time to register at NDA Headquarters for the Association's 40th Anniversary Celebration in San Diego, March 23-26. The cutoff date is Tuesday, March 19 but you can also register online or in person at the San Diego Convention Center. Don't forget to tell the hotel registration people at the Hilton San Diego Bayfront that you are attending the NDA's Annual Convention to be included in our hotel room bloc. 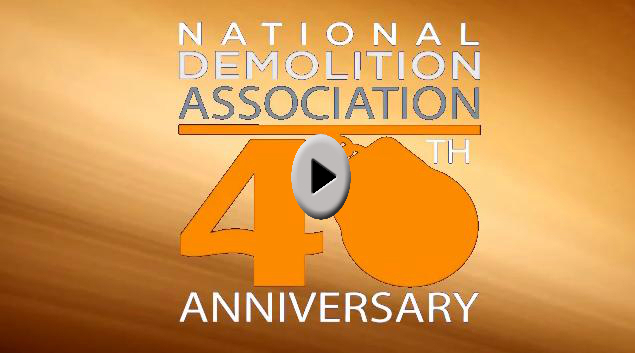 Don't miss the Association's Celebration of 40 years of service to the Demolition Industry. It's going to be fantastic! Last year, R. Baker & Son participated in a major renovation of the Statue of Liberty's pedestal and was heavily featured in National Geographic Channel's documentary covering the project, "Access 360° Heritage: Statue of Liberty," which aired in December. Baker workers performed seamlessly under unusual conditions during filming as Nat Geo camera crews followed their progress and curious onlookers watched and snapped photographs while large pieces were rigged into place. Crews from Britz Wrecking demolish the Archer Daniels Midland Flour Mill in North Kansas City, Mo., with help from KPI-JCI/Astec Mobile Screens equipment from G.W. Van Keppel Co. For more information on the demolition seen here, read the cover story, "Against the Grain" in the March/April 2013 issue of Construction and Demolition Recycling magazine. Last April, the U.S. Equal Employment Opportunity Commission issued its long-awaited Enforcement Guidance regarding employers' use of arrest and conviction records in employment decisions. The guidance highlights the EEOC's approach to using criminal records in background checks. Because claims can be made against employers by people who are injured by negligently hired or retained employees, firms need to know the risks involved in hiring decisions. Construction companies must walk the tightrope between potential claims of race discrimination by their employees or the EEOC, and claims by victims of those employees' actions. Exports of U.S.-made construction equipment increased by 13 percent in 2012 compared to the previous year for a total $26.7 billion, according to the Association of Equipment Manufacturers, citing U.S. Commerce Dept. data it uses in global markets reports for members. While that may seem like good news for the U.S. and its trade deficit, AEM notes that the 13 percent gain for 2012 follows 43 percent growth in 2011 and 28 percent growth in 2010. The growth in those two years followed a financial crisis-related decline of 38 percent in 2009. So just how massive is the Highway 99 tunnel drill in Seattle? See that new red crane, sitting next to the stub of the old Alaskan Way Viaduct? It's there just to erect another crane, three times as strong. And that crane? It will help build another, a horizontal gantry that will straddle the tunnel-launching pit in Sodo to lower the drill's 41 pieces, including the 886-ton cutter head. This is the world's biggest single-bore drill, 57 1/2 feet across. The construction industry added 48,000 jobs in February, the ninth consecutive month of job growth for the sector, as more people are working in construction than at any point in the last three-and-a-half years, according to an analysis of new government data by the Associated General Contractors of America. Association officials cautioned, however, that employment gains remain tenuous and could be undermined if Washington, D.C., officials fail to reach a deal on federal investment levels later in March. The first batch of congressionally approved federal assistance for Sandy victims will directly help 20,000 homeowners, 5,000 renters and 10,000 business owners, according to a plan recently released by the Christie administration. Half of the $1.83 billion is directed to low and moderate income households, as per federal guidelines. But, thanks to a waiver issued by the Obama administration, $25 million that would normally be earmarked for housing and businesses may be redirected to a tourism marketing campaign to let Americans know the Jersey Shore is still open. While the new eastern span of the San Francisco–Oakland Bay Bridge will open to traffic in September, the work needed to take down the old roadway is expected to take years. "These bridges define us ... in some ways as much as the bay itself," said Brad McCrea, regulatory director of the Bay Conservation and Development Commission, the state agency that oversees protection of the bay. McCrea said that building the new bridge will only be half the challenge. "Taking the old Bay Bridge down is as practically as big a project as putting the new one up," he said. Want to have a say in whether the U.S. government continues to use LEED? The U.S. General Services Administration is seeking public comments on a long-awaited recommendation regarding green building rating systems. GSA may abandon its prior endorsement of a single rating system, the findings of a special ad hoc committee suggest, instead encouraging each federal agency to make its own decisions about whether to use LEED, Green Globes or the Living Building Challenge. The construction industry added 48,000 jobs in February, the ninth consecutive month of job growth for the sector, as more people are working in construction than at any point in the last three-and-a-half years, according to an analysis of new government data by the Associated General Contractors of America. The grim work continues at a home near Tampa, Fla., where a man apparently died when a sinkhole opened up under his bedroom. Demolition efforts are resuming. Imagine a world in which construction workers' daily routine includes gaining access to their jobsites only after a machine scans the unique biological makeup of their irises or the geometry of their hands. In conjunction with the biometric scan, a security-pass lanyard is used. Each security pass carries a worker's information, including all the worker's credentials, OSHA certifications, ethnicity, gender — and even their home zip code. Multiply that scenario by 9,000 daily workers and you have a snapshot of the security technology deployed for the construction of London's 500-acre Olympic Park. For the 120,000 workers employed on the four-year project, this was a daily ritual, custom built by the Olympic Park's security consultants.